Okay before you think a thought, bare with me. I'm not promoting kick-starting the holiday season any earlier than black Friday, no way. For that, I'm incredibly old-fashioned. You don't wear white after Labor Day, & no white shoes before Easter. Winter white is another story. Well enough of that. My point is this; every darn (and I mean every) holiday season, I have the best intentions to be ahead of the game. 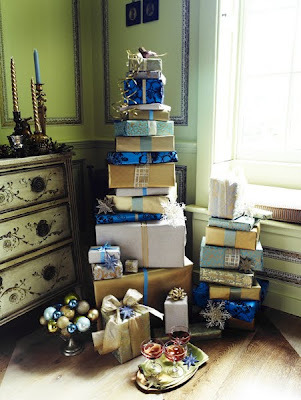 To plan and plot until my imagination transforms my home into a frenzy of festive jubilation. I think each and every one of you in some shape or form loves design, and with each holiday, it give us an outlet to fuel that creative spirit. I am the woman that staple gunned boughs upon boughs of evergreens to the entire front of my 1918 2-story farm house, because Martha did. That week I believe I bought out the local drug store of it's band-aid strips. Then there was the year that I had the half-wit idea of transforming barnyard chicken wire into 'Frosty the Snowman'. It took stacks of the Seattle Times, flour and water to build that bad boy. The only family member willing to put up with my creative dysfunction was my son Matthew; bless that child. He's now 26 and seems somewhat stable?! With the news yesterday of the demise of yet another of our beloved periodicals (Metropolitan Home), it comes as no wonder that our sources for design inspiration become fewer and fewer. 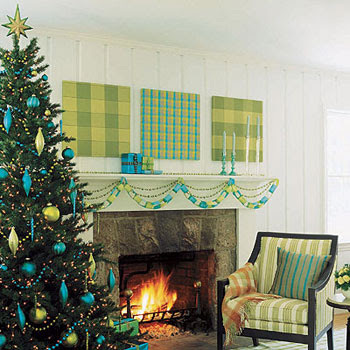 Ahh..I recall that thrill to finally receive that December issue of Domino, Blueprint, and Cottage Living. The anticipation of that spark that fed my cunning desire for the perfect Christmas household adornment. This year, I'm afraid, it's going to take a blow-torch to bring that spark back. But I refuse to give-up. I still hold out hope that there will be that one magazine spread or just one image that will be 'the one'. It is with best intentions that these images inspire you. No pressure intended. Sigh, so many gorgeous photos! 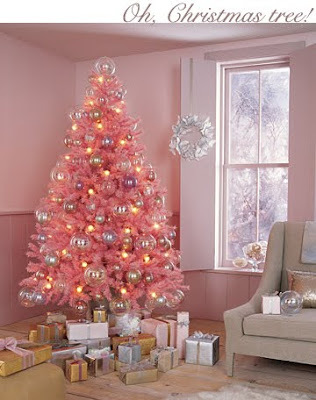 The pink tree from Blueprint will forever be burned into my mind as my ideal Christmas tree! I have so many ideas and aspirations each holiday season and so very few of them get carried out because of my horrible lack of patience and plentiful amount of procrastination. We can all aspire to be Martha though, right? Wow, girl! You set it off! That was visually stunning, with so many great ideas. I haven't gotten anything out yet, I'm just in the gathering phase. Let's get through Thanksgiving first, right?! 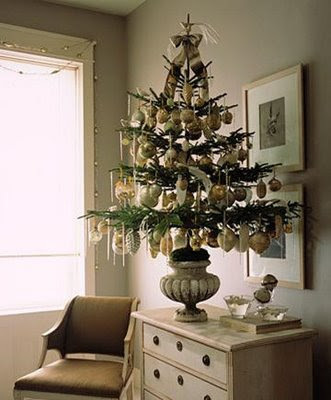 I had forgotten how much I like white trees - I might have to reinstitute them at my house! Cheers! 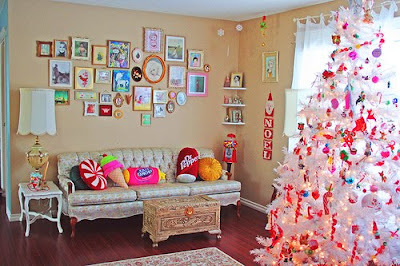 You are making me get in the mood & start decorating ASAP...wonderful inspiration JOY to the world kinda feeling! He means that it's nearly time to get the Christmas tree. All of the women in our family are the same. When we go to get the tree, ( and it has to be a real one ), it's more often than not, raining and is bitterly cold. All of the trees are stacked outside and I point at trees and he has to pull them out and hold them up, while I umm and ahh as to whether it's the perfect shape !!!! .....but, he loves it, really ! Oh I love the holidays! 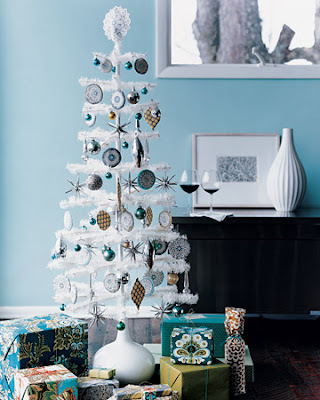 I stepped in West Elm the other day and got a little taste of the holiday spirit! 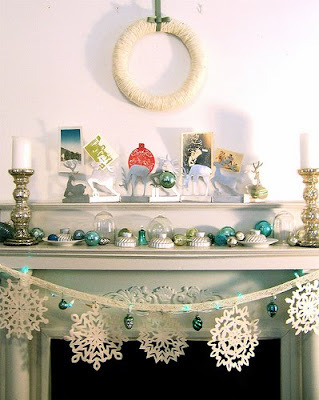 I'm dying for snow, but don't think I will be seeing that in California-( Thanks for sharing you have inspired me to decorate! 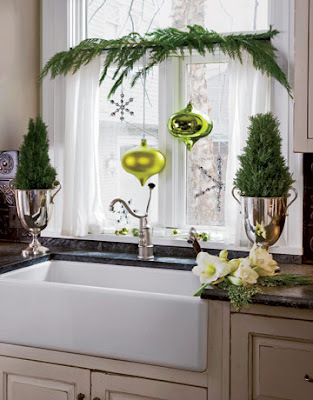 i think the the bulbs and the branch over the farmers sink are adorable. oh yeah, love the black doggy. i am trying desperately not to think about xmas or even tomorrow. i am having a hard time finding my 'arss' with both hands today. Oh my, fabulous pics! I already had a couple of these in my design folder, and will be borrowing a few more! 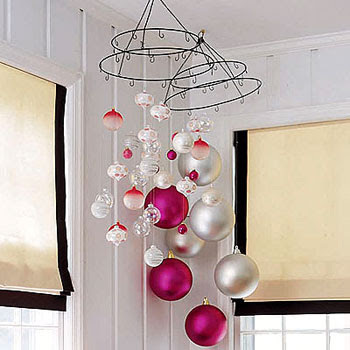 The first two in particular are so dreamy - I love all of that white with the hot pink. 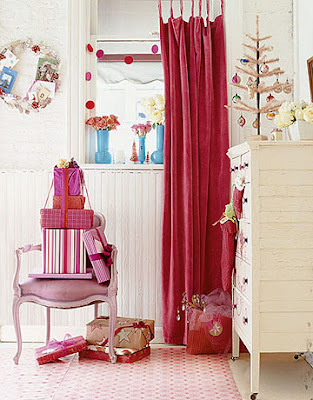 I'm gaga over white floors, though sad that pink velvet drapes won't match my oak hardwoods. I think they would look rather nice with white walls and our black Eames airport chairs. 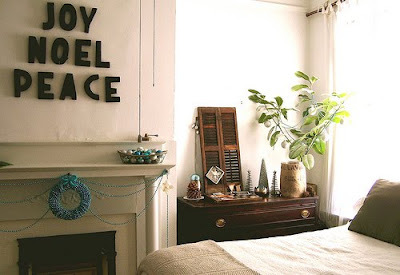 I will get the decorating jones out of my system early, for we are definitely going to paint our living room white and hang crown moulding in a couple of weeks, then rearrange furniture and artwork. 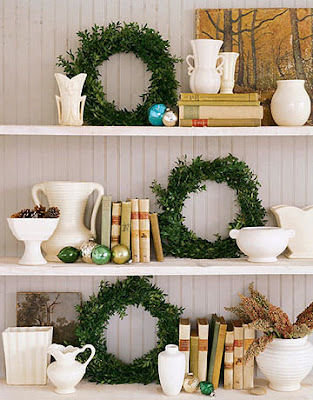 By the time that is finished, it will be time for Christmas decorating, yay! That'll get me in the mood all right! Some of those photos are fabulous. 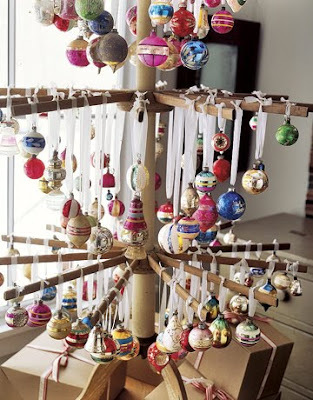 I love the wooden tree with the antique ornaments! I'm getting my Christmas stuff out now! Deb darling this is a stunning post. Now I am all ready for Christmas. Darling how is my favourite blogger, I hope life is treating you marvelously. As you know mine was a bit topsy turvy of late, but is slowly returning to normal. I thank you for checking in on me and for the sweetest comments you always leave behind, you are a dear friend. I am now off to read the posts I've missed on your blog. Darling I am so sorry, I meant to ask as to how your mum is doing? My prayers are with you and your family. 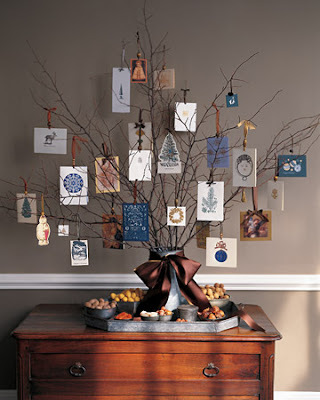 Well thanks to you I have finally seen some of the most beautiful and inspiring Holiday images yet!! It is so sad to have lost so many of our favorite magazines...one after another. Each and every one of your images in this post are just beautiful. 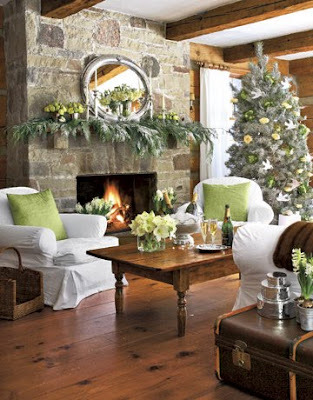 These photos are so gorgeous that they actually got in the mood for Christmas. I really haven't had a chance to think much about it yet. What are we going to do without all of our usual holiday magazine issues?! I always have the best intentions too, but they never go the way they did in my head! 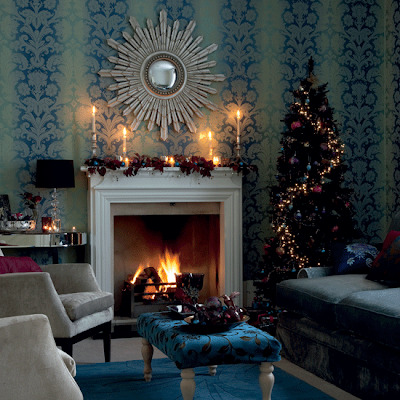 These are some lovely images, definitely gets me in the mood! Great photos. These are all incredible. Some really fantastic ideas here. I never put my Christmas decorations up until Thanksgiving weekend. That's always been my tradition. Ohhhhhh, you are so getting me even more in the spirit. We're going easy on the gifts this year. 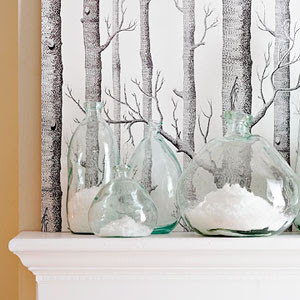 But the decorating...that's another story! so gorgeous!! lovely inspiration!! 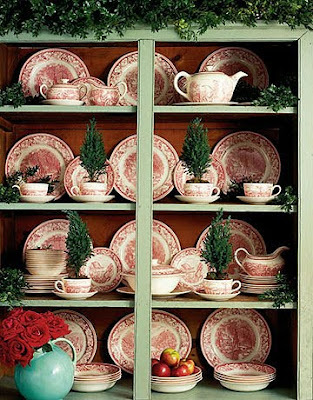 esp loving that pink transferware. Oh they did, Deb! All that hot pink in the first few images is truly spectacular -- what a nice change of pace from green & red. I never put up a Christmas tree before Black Friday (and it's always down New Year's Day! ), but I can't help but think I need to AT LEAST kick start the holiday shopping (if only virtually for some blog posts!). ...But where did this year go?! Is it just me or has 2009 FLOWN by? Really great photos! I go totally nuts when it comes to Christmas time! Great post as always ; D! Loved this!! Each of the photos .... swoon worthy!! Try The English Home.... that should get your juices pumping!! I was SO disappointed in the cover of Veranda this month!! I mean, come on!! The Christmas Issue?? 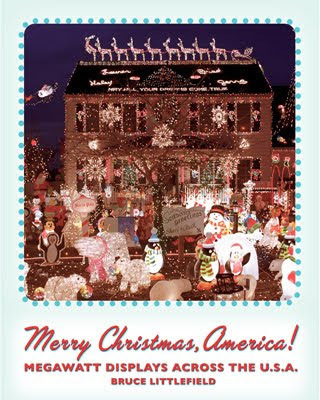 I am so excited for the holidays! I love this post! The anecdote about your son helping you to decorate is precious. I really miss Domino at this time of year especially because I liked their gift guide. I am really loving that blue flocked wallpaper in the photo with the starburst mirror. 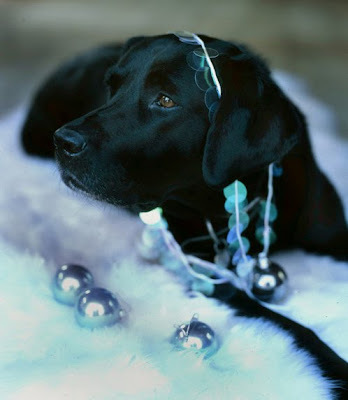 I love, love, LOVE the last picture of the Black Lab!! Priceless!! 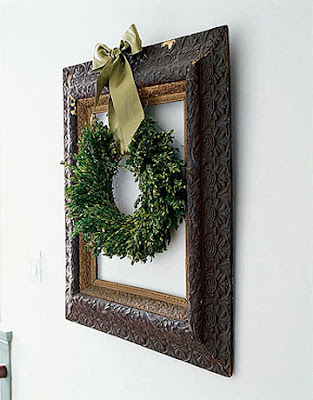 Thanks for posting so many inspiring Christmas pictures. 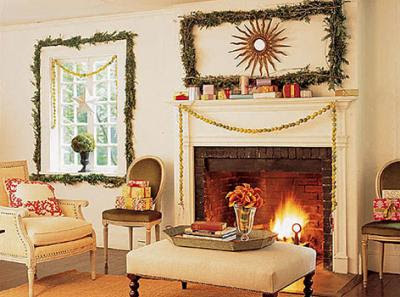 I've gotten into a decorating rut the last few years, so I'm hoping to mix things up a bit this year and try some new things. Cant wait for christmas, can't believe its that time of year again! LOVE Christmas!!! 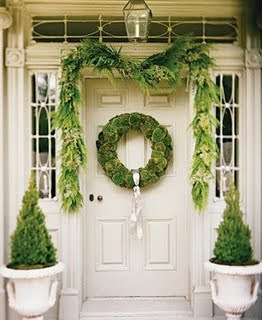 I cannot wait to transform my home... only 11 more days and it will look a lot like Christmas!!! Beautiful images! 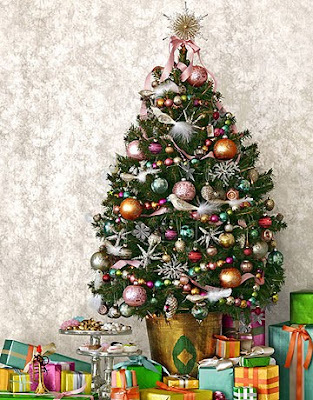 I would love a non-traditional tree this year, but alas the boss is a stickler for the green, needle shedding, traditional version. Wow - these images are amazing!! I feel very inspired now - thanks!! 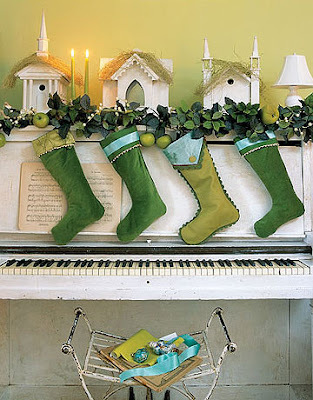 Deb -- amazing post ... loves me some Christmas, and just really appreciate these wonderful images. all the season's best! -Jg.